A married teenage couple have been charged with planning to carry out a terror attack in Sydney. Sameh Bayda and Alo-Bridget Namoa, both 19, are accused of "conspiracy to do an act, or acts in preparation for, or planning, a terrorist act or acts". The charge carries a maximum penalty of life in prison, the Australian Federal Police said. The pair were already in custody after being arrested in early 2016 on lesser charges, a court heard on Wednesday. Previous court documents alleged Mr Bayda had collected instructions about how to make an improvised explosive device and commit a stabbing attack. Ms Namoa was accused of recklessly possessing a hunting knife and instructions relating to a homemade bomb. 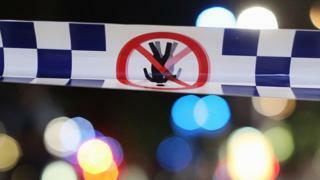 Their charges were upgraded on Wednesday following an investigation by New South Wales (NSW) counter-terrorism police. The pair did not appear at a preliminary hearing in the Sydney Central Local Court later in the day. Magistrate Alexander Mijovich said the case should move forward because the brief of evidence did not contain new material. "It needs to proceed, it can't just keep on meandering along now that they've sorted out the charges and the brief," he said. The case will return to court on 15 March.